Not just skin deep: Changing the Max interface should make it easier and faster to produce patches for beginners and advanced users alike. History will have to be the judge of Nintendo’s slim white box and controller-wagging interface, but I heard some similar development goals at the AES audio show this weekend. Nowhere was this more apparent than Cycling ’74’s upcoming Max 5. Substitute the word “patcher” for the word “gamer”, and you’ve got a snapshot of the new Max. After all, whether you’ve touched Max before or not, you’ve likely got some needs in at least one of these categories. 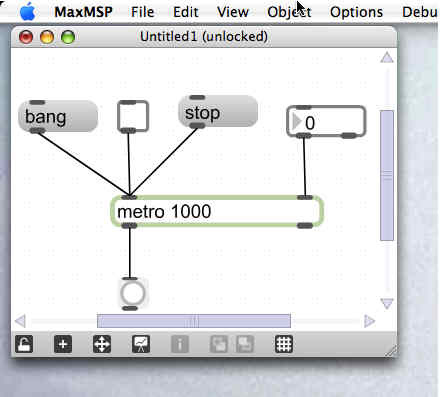 Beginners are easily intimidated by the “visual programming” metaphors of a blank-slate, modular tool like Max. Many others get through a couple of patches, often in a school course, but wind up having difficulty getting beyond that first work later on. And even advanced users (maybe especially advanced users) are always looking for ways of working faster. Max has a new visual browser for selecting objects. But if you can’t tell what those icons signify, there’s also more integrated help, and object names are auto-completed as you type them into a patcher window. The interface zooms, scales, and snaps: I knew this was coming, but I was really pleased at how Max-like this is. It still looks like Max, but it’s more usable. There’s a patcher inspector: The inspector lets you easily adjust attributes without mucking about with typing things into an object box or sending messages to an object, which was always very confusing. You don’t see much of this in the video, but trust me, this is huge, especially for more-complex Jitter objects. 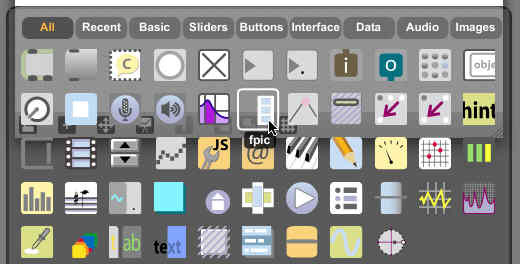 And while this is shades of Quartz Composer, it works much better than the clunky UI implementation in that tool. 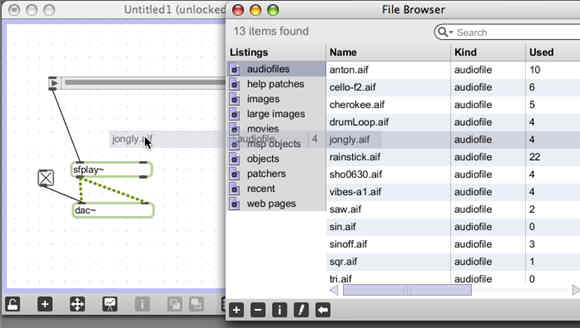 A new file browser takes cues from iTunes and Ableton Live. Debugging and feedback and help everywhere: The old way of working with Max was pretty slow. Add an object. Click the object’s help to figure out what it does. Look up its help page. Go find the tutorial reference in which it’s introduced. Add a print object to watch what data is coming out of it. Go back and try to see why it’s not working. 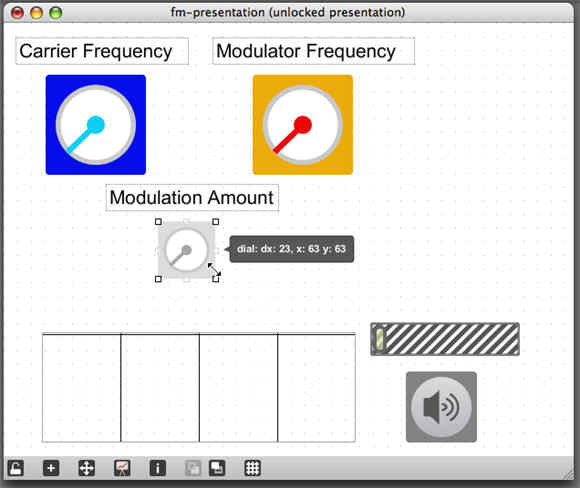 Now, there’s feedback everywhere: pop-up hints for each inlet and outlet, integrated help, the ability to mouse over objects and see what data is moving through them (including Jitter matrices, apparently), and even better-organized data feedback in the Max window. The integrated help is much richer, too, though it wasn’t quite ready for demo when I saw it; I expect we’ll find out more about this soon. There are still lots of questions, of course: there’s no solid release date or pricing plan, and we haven’t yet heard what Cycling is cooking up with its new partner Ableton, or how that fits into Max 5. Jitter will be supported with this new release, though, like the internals in Max/MSP, it doesn’t sound like there will be any earth-shaking changes immediately. (I.e., it won’t be Jitter 2.0.) Then again, Jitter patchers should benefit just as much as MSP heads from all these other features, so I wouldn’t underestimate the potential there. I think there’s no question this will step up the game for custom-patched music and multimedia software. Max isn’t the only game in town by any means, though it is arguably the most extensive tool (especially if you’re counting number of objects). I can’t wait to get my hands on the new Max and share the patching experience, and I’m equally interested to see what happens with the next version of a more specialized tool like Reaktor. As always, stay tuned.